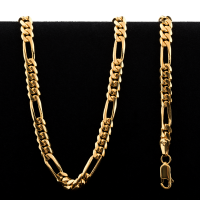 Wear your wealth today with the purchase of a 22 kt Figarucci style gold necklace at near bullion prices. at a minimum total weight of 33.5 grams this necklace is an easily transportable and discerning way of preserving your wealth. This Figarucci styled necklace features 22k gold, fine craftsmanship. Dynamic Bullion pricing means that you can save on your purchase as gold prices fluctuate. Metal weight displayed in details is the gold content only. Actual item may vary slightly from the image displayed. 33.5 gram 22 kt Figarucci Style Gold Necklace Wear your wealth today with the purchase of a 22 kt Figarucci style gold necklace at near bullion prices. at a minimum total weight of 33.5 grams this necklace is an easily transportable and discerning way of preserving your wealth. This Figarucci styled necklace features 22k gold, fine craftsmanship. Dynamic Bullion pricing means that you can save on your purchase as gold prices fluctuate. Metal weight displayed in details is the gold content only.